The Home of European Drag Racing "The Fastest Motorsport on Earth! Santa Pod is the most famous drag racing track outside America, attracting the best drivers and race teams in European Drag Racing. 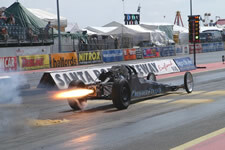 Affectionately known as the 'POD', Santa Pod is the place to race! Few motorsport venues can offer such thrilling 'close to the action' viewing and with over 35 different events there's a real emphasis on family entertainment. 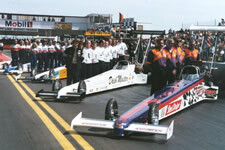 Tucked away in the corner of Northwest Bedfordshire is one of the most famous racetracks in the world - Santa Pod Raceway. Santa Pod has earned the reputation as the home of European Drag Racing, which features the most powerful car and bike engines in the world, yet surprisingly little is known about the sport which, has a huge and dedicated following around the world. Drag Racing has its origins in the USA during the 1920's. During prohibition the sellers of illegal alcohol, the Moonshine Boys outran the authorities by making their innocuous runabout cars fast and powerful by hiding bigger and more highly tuned engines inside - the Hot Rod was born! After the end of prohibition the Hot Rodders continued and all over America roads were being used to settle the 'mine is faster than yours argument'. Most towns had a main road running down the middle and junctions controlled by traffic lights, the Hot Rodders would race down the main drag from one set of lights to the other - the beginning of Drag Racing. Drag Racing took off in the UK during the 1960's when, like in the USA, many of the old disused airstrips around the country were converted to drag strips. Podington airfield, near the villages of Hinwick and Podington, was formerly a wartime airbase used by the USAAF during the Second World War. In 1966 permission was obtained to use the airfield as a drag racing complex, the ¾ of a mile main runway being used as the drag strip. 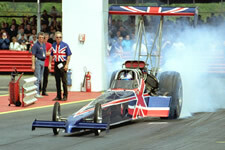 The track was named Santa Pod after the Santa Ana strip in America, combined with the name of the local village of Podington. 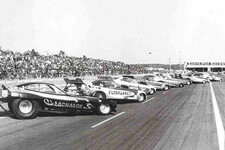 Since then the name Santa Pod has become synonymous with the sport of Drag Racing in Europe. Today the raceway hosts events throughout the year including the FIA European Drag Racing Championships and the 'Run What You Brung' (RWYB) events where anyone with a valid driving licence can have a go and put their own vehicles and skills to the test.